Since each IP has an assigned number which appears in ARIN'S database you can determine to which other IP is connected to. You can also determine the relationship of both numbers and how they are related to other networks where they meet at the top of the hierarchy. The government of Cuba owns the IP Classes 216.72.24, 216.72.25, 216.72.26 and 216.72.27 as part of the network 216.72.0.0 which in turn originates in a company called GLOBAL ONE. This corporation is domiciled in Reston, Virginia, USA a few blocks away and on the same street of Castro friendly American On Line (AOL) the Internet Service Provider (ISP) with the greatest number of subscribers in the world. Global One received authorization from the Federal Communications Commission (FCC) to operate as a "facilities base" and resale carrier in the United States. This license granted under Section 214 of the US communications Act, authorizes Global One to directly provide its full portfolio of IP to US based customers, both domestically and between the U.S. and other countries. Global One is a leader in "all-distance" communications data, Internet and international services. Note that another company, Sprint, is closely connected with Global One, also of global reach and at the forefront of advanced data communications services. Sprint's Government Systems Division has been delivering telecommunications solutions tailored for defense agencies and governments for more than a decade with a significant portion of those cutting edge communications services in the area of Intelligence. http://www.osint.net - Ernesto Rossbach in charge. Programming a complete bank system created under the concept of On Line Transaction Processing added to a local box system. Development and implementation of a network for transferring data to remote places through cellular lines, microwaves, radio and normal phone lines. Protocol development for communicating VISA-NET with UNIX. Installation of Bank Systems in Russia. Installation of Communication Systems between the Science Academies of Moscow, Denver and Guatemala. Specialized in "satellite telephone" sales that operate worldwide and phones designed to work on transport vessels on the high seas. The list of the members of this club is by itself revealing. Since this information is public the arrangement is obviously not a cover operation. Although this information may seem rather secretive or classified, everything here was obtained through regular public channels. We are not in this particular field of counterintelligence and we did not travel into ememy territory to obtain sensitive materials. What we can see is that there is, and has been, a pattern of cooperation that implies the existence a some long-standing agreement between the United States and Communist Cuba. This relationship has only become more evident through the use of modern information gathering techniques. Very rarely but possible the CIA and the KGB or the CIA and Cuban Intelligence could work together on a particular common interest operation or case. Both parties would do it very cautiously. But to operate on a daily basis within the same "communication system" would be difficult to imagine unless they ceased to be enemies as it happened with the OSS/CIA and Nazi intelligence (enemies), later West German Intelligence (allies). In 1992 Cuba apparently agreed to receive US computer scientists and communications experts to assess their computer systems and network connectivity. 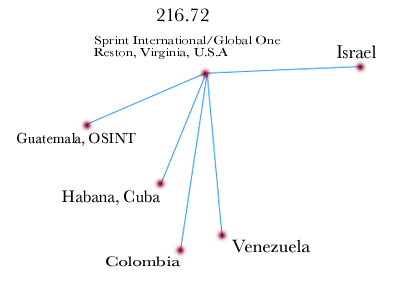 Here is a historic excerpt explaining Sprint International's connection to the communist block since at least 1988 and the thorough inspection that was carried out by the US on Cuban soil. CENIAI is also Cuba's connection to IASnet. IASnet is a joint network for (in many cases, now former) socialist countries operated by VNIIPAS (The All Union Scientific Research Institute for Applied Computerized Systems) in Moscow. VNIIPAS has multiple links to Western data networks using X.75. A link to Sprint (previously known as Telenet) has existed since at least 1988, and when we visited CENIAI we were able to dial into one of our computers in Arizona via Moscow and Sprint. CENIAI also provides electronic access to business, biomedical and other databases. A more detailed discussion of CENIAI's activities may be obtained by anonymous ftp from the global_net directory at dhvx20.csudh.edu. The Cuban connection to IASnet is through an X.25 PAD board located in one of the two CENIAI Unix microcomputers. These systems handle approximately 485 users, and are connected to each over via an Ethernet. The connection from Cuba to Moscow is via a satellite at 4800 bps. This line was installed in 1983. Until 1990, they paid no charges for use of the line. Now, they pay dollars or other hard (convertible) currency to VNIIPAS for packet traffic over the IASnet circuit. In 1984, it was reported that Cuba was the most prolific user of the IASnet services, with a total of 360 hours of connect time. One of the authors (Snyder) was able to make a direct connection from the CENIAI Unix system to a VAX/VMS system in his apartment using a single X.121 address at the Havana end. To get to the Login prompt, his connection ran from the PAD program on the CENIAI Unix microcomputer over the X.25 satellite link to Moscow. VNIIPAS received the call and routed it to the international Sprint network. It was routed to Reston, Virginia where it entered the domestic US network. Sprint conveyed the call to Columbus, Ohio, and passed it to the CompuServe X.25 gateway. CompuServe carried it to University of Arizona's Telecommunications Group where it was translated from X.25 to DECnet format, and routed through Ethernet, fiber optics, a 56K line, and an asynch 9.6K DECnet line to Snyder's apartment. The gateway VAX in his apartment passed the call to his workstation VAX, which displayed ``Username:''! In the 1995 seminar named "Internet Society Workshop on Network Technology for Developing Countries" that took place in Honolulu, Hawaii high ranking technical officials from the U.S. telecommunications giants Sprint International and MCI, the United States Center for Disease Control, the US Department of Defense Information Systems and Cuban biotechnology had a chance to meet in person. 1. To train a critical mass of trainer/professionals in network infrastructure, transport, services, and management to be able to support an extension of meaningful Internet-related activities within the countries represented. 2. To identify and share individual and institutional contacts as well as information sources that will assist the process of national development, using international Internet connections. 3. To build robust professional linkages between all participants in the programs so that the mentor-student and colleague-colleague relationships formed during the workshop and conferences will remain strong and of continuing usefulness well beyond the workshop and conference. 4. To increase the level of cooperation among existing projects and activities for establishing data networks in developing countries. Armas Alvarez de la Campa, Carlos "Cubanacan, Playa"
Cooper,	Alecia Manager, SprintLink Product Mgmt. We grant Sprint Communications Company, L.P. ("Sprint"), authority, pursuant to Section 214 of the Communications Act of 1934, as amended, and Section 63.18 of the Commission's rules, to upgrade an existing private line circuit between an authorized international earth station in Franklin, New Jersey and an INTELSAT Atlantic Ocean Region ("AOR") satellite, together with necessary connecting facilities, from 256 Kilobits per second (Kbps) to 2 Megabits per second (Mbps). Sprint is a limited partnership organized under the laws of Delaware and is a common carrier subject to the Communications Act of 1934, as amended. Sprint is currently authorized by the Commission to provide service directly to Cuba. On March 2, 2000, Sprint filed this Application seeking authority to lease and operate additional satellite facilities for service between the United States and Cuba. On March 15, 2000, we placed the application on public notice. We received no comments or petitions to deny. 5) carriers shall report the number of circuits activated by facility on June 30 and December 31 of each year and on the one-year anniversary of the FCC authorization. Furthermore, applicants must provide a narrative description of their proposed agreement as well as a sworn statement that the foreign correspondent agrees to activate the proposed circuits on the Cuban end. Sprint states that the proposed facilities will be operational within a year and that the facilities requested are necessary for, and limited to, the delivery of a signal to an international telecommunications gateway in Cuba. Because the proposed facilities are private line circuits, there are no settlement payments. Sprint states that it and its foreign correspondent, Empresa de Telecomunicaciones de Cuba S.A. ("ETECSA") will each provide and bear the cost of matching half circuits and connecting facilities. The U.S. Department of State advised us that it approves the grant of this Application. We find that granting the Application will further the goals of the Cuban Democracy Act of 1992, which calls for the authorization of facilities "in such quantity and of such quality as may be necessary to provide efficient and adequate telecommunications services between the United States and Cuba." We find that the Application is consistent with the Executive Branch guidelines set forth in the Department of State letter for implementation of the Cuban Democracy Act of 1992. 14. IT IS FURTHER ORDERED that this Order is subject to revocation without a hearing in the event the Department of State or the Federal Communications Commission determines that the continuation of communications between the United States and Cuba is no longer in the national interest. 17. IT IS FURTHER ORDERED that this authorization, issued pursuant to Section 0.261 of the Commission's rules, is effective upon release. Petitions for reconsideration under Section 1.106 or applications for review under Section 1.115 of the Commission's rules may be filed within 30 days of public notice of this Order (see Section 1.13). The level of cooperation between the United States and the Cuban government has reached such proportions that there is or has been a Cuban government consultant on the US NASA space program, which by the way is under the direction of the US Vice President. We are not a US law experts but how did we manage with the existing Helms/Burton law in force, to negotiate the purchase or acquisition of these IP numbers? We congratulate all involved at MININT and Colomé. Think about it, they are operating in the same network class 216.72 and in the same most sophisticated technology network there is. Again, what all of this means to us is that for some time there must have been far reaching deals that determined the destiny of millions of people. Finally, there is in the public records easily available a Robert Castelli who appears as the administrator of part of the 216.72 network at Sprint International/Global One. There is a Robert Castelli who is considered the top US Security, terrorism and biological weapons expert. There is a Professor Robert Castelli of John Jay College in New York. There is also a Robert Castelli in charge of making administrative changes to the internet configurations of the Angolan Telecommunications Company.